We have had tons of rain, but we have really enjoyed the Christmas break. We went back to Defy Gravity with Bethany, Jake, and the Bradleys. Everyone had a blast! We have enjoyed the warmer temperatures and played outside a lot. We had Bethany and Stella over for sleepover. These girls had so much fun and did everything. Painting, games, movies, cookies. They stayed up to 10:30 and then got up at 7:15ish and jumped on Jeremy in the bed. Jovie was pretty impressed with the sparkly eye collection of all the girls. Haven's tooth continued to get looser. We celebrated the New Year with our favorite people at Linebergers! While there we got news that the tooth fell out! Christmas morning Jovie woke us up because she thought she saw more presents under the tree. She didn't even see the other presents on the floor. She was thrilled and wanted to wake the others up. Haven wanted to sleep in but then she got excited too. Jensen woke up yelling as usual and was ready to play. We had QT donuts for breakfast. 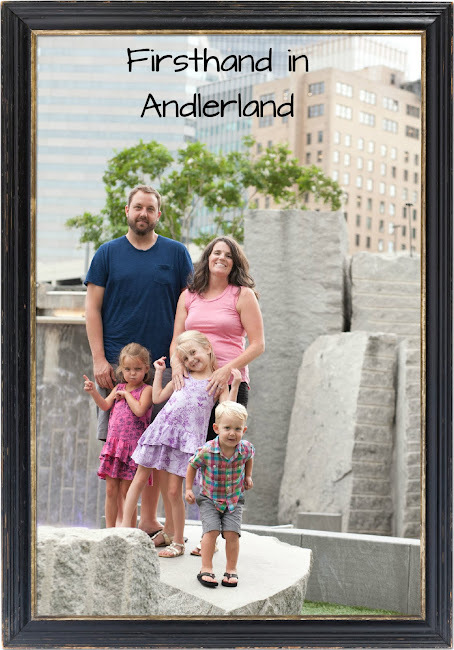 We headed to the Andlers for the rest of the day. Lyndsey got Haven the fart gun. It is pretty funny. We sang happy birthday to Jesus. More loot to play with and enjoy. Luckily, the kids helped cleaned out all of their toys the day before Christmas.